All native Presto functions can also be used on Treasure Data. The complete list of function can be found on the Presto Function and Operators pages. This example selects records with timestamps ‘2013-01-01 00:00:00 PDT’ or later. Notice that the time of day ('00:00:00') can be omitted, as shown above. Alternately, the time of day can be specified up to seconds. In general, the time string should be formatted as either 'YYYY-MM-DD' or 'YYYY-MM-DD hh:mm:ss'. For example, '2013-01-01' or '1999-01-01 07:00:00'. We strongly recommend that you take advantage of time-based partitioning. Refer to the Performance Tuning article for more information. This UDF returns true if the unix_timestamp is equal to or later than the start_time and older than the end_time (start_time <= time && time < end_time). If end_time is omitted or NULL, the UDF assumes it’s infinite. If start_time is NULL, the UDF assumes it’s 0.
start_time and end_time can be a string that represents a time (e.g. ‘2012-01-01 00:00:00 +0900’) or a UNIX timestamp (e.g. 1325343600). If the format of start_time or end_time strings is invalid, the UDF returns NULL. default_timezone is used to interpret the timezone of start_time or end_time. If start_time or end_time themselves specify a timezone (e.g. ‘2012-01-01 +0700’), then the default_timezone is ignored. If default_timezone is not specified and start_time or end_time does not indicate a timezone, then the UDF uses ‘UTC’ as the timezone for start_time or end_time. A list of supported time zones can be found here. This UDF returns the exact time when the job was scheduled by the scheduled query feature. The returned value can differ from NOW() because the actual query start time might be delayed. If the query is not a scheduled query, the UDF returns the time when the job was issued. You can use this UDF with TD_TIME_ADD for incremental aggregation. We strongly recommend that you take advantage of time-based partitioning. Refer to the Performance Tuning article for more information. Not using time-based filtering in SQL SELECT statements can cause inefficient full table scans that affect query performance. This UDF returns true if time value is within the interval which is represented by interval_string (state time <= time < end time). interval_string must be a 'duration/offset' formatted string. The offset is optional and the UDF assumes offset is the current time (the job scheduled time actually) if offset is omitted. Also support 'q' for quarters. For example, '-1d' means yesterday and '-3M' means last 3 months. The interval is calculated in the specified time unit. This means '-30m' ls the last 30 minutes from the beginning of the latest minute, not from just now. offset can be specified relatively (e.g. '3d/-1y') and specifically (e.g. '1y/2018-01-01'). For example, '3d/-1y' means the first 3 days of the last year and '-1M/2018-04-01' means the last 1 month before '2018-04-01'. In other words, '2018-03-01' to '2018-03-31'. default_timezone is used to interpret the timezone of interval_string. If interval_string specifies a timezone (e.g. '-1h/2017-01-23 01:00:00 +0700'), then the default_timezone is ignored. If default_timezone is not specified and interval_string does not have a timezone, then UDF uses 'UTC' as the timezone. A list of supported time zones can be found here. TD_INTERVAL_RANGE can be used to confirm the time range of TD_INTERVAL. TD_INTERVAL_RANGE returns an ARRAY[(start time), (end time)]. interval_string must be a 'duration/offset' formatted string. The offset is optional and the UDF assumes offset is the current time (the job scheduled time actually) if offset is omitted. Also support 'q' for quarters. time zone is used to interpret the timezone of interval_string. 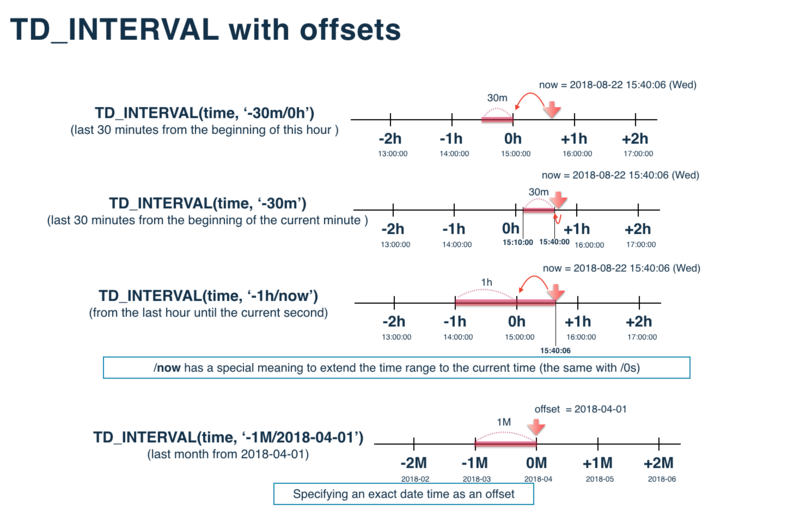 If interval_string specifies a timezone (e.g. '-1h/2017-01-23 01:00:00 +0700'), then time zone is ignored. If time zone is not specified and interval_string does not have a timezone, then UDF uses 'UTC' as the timezone. A list of supported time zones can be found here. This example selects records with timestamps ‘2013-01-01 00:00:00 UTC’ or later but older than ‘2013-01-02 00:00:00 UTC’. The formats above can be combined. For example, ‘1h30m’ means ‘after 1 hour and 30 minutes’. default_timezone is used to interpret time. If time has timezone (e.g. ‘2012-01-01 +0700’), then default_timezone is ignored. If default_timezone is not specified and time does not specify a timezone, then the UDF uses ‘UTC’ as the timezone for time. A list of supported time zones can be found here. 'year' and 'month' durations are NOT supported, because to do so would adversely impact performance. A month can be 28, 29, 30, or 31 days, and a year could be 365 or 366 days. TD_TIME_FORMAT converts a UNIX timestamp to a string with the specified format (see the Supported time formats in TD_TIME_FORMAT UDF page for available formats). For example, ‘yyyy-MM-dd HH:mm:ss z’ converts 1325376000 to ‘2012-01-01 00:00:00 UTC’. If no timezone is specified, the UDF uses UTC. 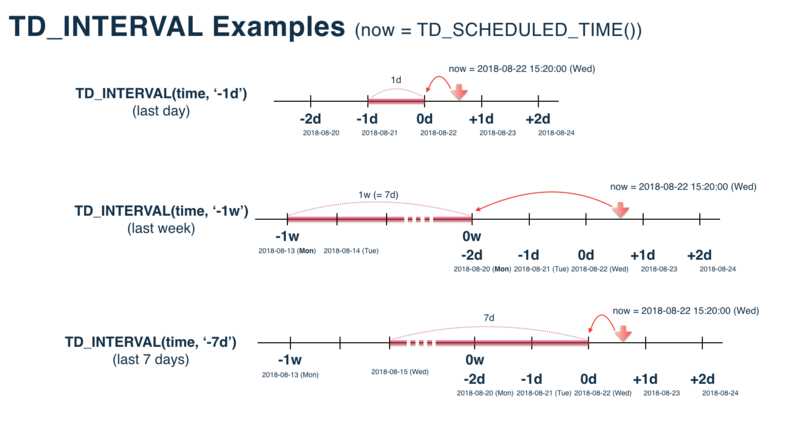 How does TD_TIME_FORMAT handle Leap Second? If the format string has ! as the suffix, it truncates the date time string at the specified unit. An optional ‘timezone’ parameter can be specified to indicate an alternative reference timezone for the ‘unit’. If the input ‘time’ is in global UNIX time format, in different timezones, the start of a day corresponds to different times. This function mimics the functionality of native Presto’s date_trunc function. However, Presto’s date_trunc does not allow specification of the timezone. with time equal 1416787667 corresponding to ‘2014-11-24 00:07:47 UTC’ returns 1416787200 corresponding to ‘2014-11-24 00:00:00 UTC’. the function returns 1416758400 because the start of day for the ‘PST’ timezone is 8 hours behind the start of day for ‘UTC’. Sessionization of a table of event data groups a series of event rows associated with users into individual sessions for analysis. The series of events to be grouped into a session must be associated with the same user identifier (typically IP address, email, cookie or similar identifier) and events are separated by no more than a chosen timeout interval. TD_SESSIONIZE_WINDOW is a UDF window function used for sessionization. It replaces TD_SESSIONIZE.TD_SESSIONIZE_WINDOW provides consistent results and better performance. The following example is equivalent to the SELECT statement example in the deprecated TD_SESSIONIZE. TD_PARSE_USER_AGENT is now deprecated. It will not be updated and will be disabled in the future. We recommend to use TD_PARSE_AGENT. The example shows the result of parsing the user agent from an access log. If you want to extract a specific ‘key’ from the user agent map. TD recommends using the element_at presto function because it is tolerant of non-existent keys. Extracting keys with the  operator (e.g. TD_PARSE_AGENT(<agent_string>)[‘<keyname>’]) will throw an error if the sought after key is not present in the map.
! in the map returned by <tt>TD_PARSE_AGENT(agent)</tt>. This UDF calculates the variable length digest from a given string. It usually generates 6-10 characters of digest from the given string. Due to the higher compression ratio, there is a higher collision ratio, around 5% on average. If you want to avoid the collisions, increase the value of the weight parameter. This UDF converts currency for the specific date, by accessing the currency exchange rate database. Both Hive and Presto UDFs use a geolocation database supplied by Maxmind. Due to release schedules, the release level of the Maxmind database used by Hive and Presto might be different. This might cause inconsistent results between Hive and Presto geolocation functions. This UDF returns the concatenation of column with delimiter ordered by orderkey in a group of values. Geometry types are the building blocks of geo-spatial queries and calculations. They are used as arguments to geospatial functions. Geometry type is product of a constructor function. ST_Point and ST_Polygon are examples of geospatial functions used to obtain binary representations of a point, `line, or polygon. You can also use them to convert a geometry data type to text. A constructor function that returns a geometry type point object with the given coordinate values. The above query returns a list of schools that are within a geographic area stored in the counties table. The ‘st_point’ constructor is used to create the point that is being used. The above query returns a list of reservoirs that are within a geographic area of a park in the parks table. The ‘ST_Polygon’ constructor is used to create the polygon that is being used. ST_Intersection and ST_Intersects are examples of Geospatial Relationship Functions. Relationship functions allow you find relationships between two different geometric inputs. They return a boolean result type. Returns the intersection of 2 points as a text coordinates.